1. On the 15th hole Saturday, a reachable par-5, Mickelson’s second shot hit the green and rolled off the edge into a valley. It wasn’t a great place to be, especially with the pin on the left side of the green near the water. 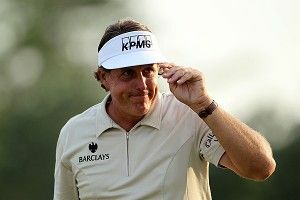 The camera caught him rubbing his head beneath his KPMG visor and slumping his shoulders in that desperate deflated posture Mickelson embodies so well. But when he reached the ball, the gears in his gambler brain started turning. It’s easy to spot, because his eyes get bigger and bigger. I didn’t always love Phil, and that’s largely because I didn’t understand him. But I do now, and I especially love when those eyes start to expand; that’s when you know something ridiculous is about to happen. And it did. Phil took an incredibly risky flop shot, a high, arcing attempt to land it softly on the green and take the slopes out of play. The risk of landing short was that the ball would trickle back into the same valley, and the risk of landing long was water. Flop shots are famously hard to control compared to an ordinary chip, and it’s not unreasonable to guess that literally no other player in the field would have attempted the flop in that pressurized situation. But Mickelson has one of the best short games in the world, and one of the least cautious minds. He hit it beautifully, and sank the putt for a birdie. 2. Sunday on the par-3 fourth hole, Phil was 8 under par and just two shots off the lead after Louis Oosthuizen’s incredible albatross on the second. His tee shot hit a railing on the stands to the left of the hole and bounced into the woods, where it nestled in some leaves a few feet deep. Phil’s best option, at that point, might have been to retake the tee shot and try to go up and down for a bogey-4. He also could have dropped two club lengths away from the obstruction, taken the penalty stroke, and tried to do the same from the rough. Instead, the old gambling instincts took over. Phil is a lefty, but a tree prevented him from lining up properly, so he turned his club head upside down, lined up from the right-hand side, and tried to chunk the ball out of the woods. It’s impossible to imagine what he thought the best possible outcome was, but it was surely there, hovering like a mirage in his mind, the ball sailing out and landing safely in the bunker or maybe, somehow, finding its way onto the green. That’s how the gambling mind works. Supposedly, the act of taking the risk, rather than the payoff, is what stimulates the addictive centers of the brain, and keeps the gambler gambling. Phil is so talented, and so capable of extraordinary shots, that his propensity for risk taking probably seems very logical in his own head. Flop shot on the 15th? Why not? Reverse chunk on the fourth? I’ve done it before. And if he fails to take the full situation into account — the fact that this is the Masters, for god’s sake, and maybe some discretion would be wise — it’s because the gambling clouds his vision and overrides the anxious part of the brain that considers the awful down side. Such as, say, losing a major tournament. The first attempt from the woods went about a foot into the mulch. He had to hit the same shot again, and this time it squirted off the inside of his inverted wedge and came to rest on a hard surface beyond the bunker. He tried to make the perfect shot from there, rather than playing it safe, and came up just short of the green. It rolled down into the sand as he stared in defeat. From the bunker, he went up and down for a triple-bogey 6. The -8 became a -5, and though Phil clawed his way back to -8 by round’s end, he’d cost himself a chance to finish with the leaders at -10. With Phil, you have to take the good with the bad. The spectacular moments come from the same wild source that inspires the epic, major-killing disasters. Many golfers talk about managing a round, but Phil goes out and attacks the course, consequences be damned. When he succeeds, those big eyes glow with a euphoric intensity, and when he doesn’t, he’s a caricature of the failed gambler, with his deer-in-the-headlights expression of disbelief. But if we’ve learned one thing, it’s that he’ll never change. needless to say, the smart move was to lay up and try to go up and down for a birdie. If he had to settle for par, no big deal; again, he was leading. On Sunday. At Augusta. “There’s an opening in the trees.” So he talked himself into it like a true gambler, and pulled out the six. He took a vicious hack, tracked the ball with his maniacal wide-eyed stare, and watched it land about five feet past the danger zone. He came that close to utter disaster. Instead, the brilliant shot set him up with a short eagle putt, which he missed. But that’s a footnote; he got the easy birdie, and he went on to win the Masters handily. And that’s Mickelson then, now, and forever — wild to the core.